Evening! I recently visited a friend who’s just moved house, but was so disorganised, I didn’t have much time to buy her a pressie. Fortunately, working in the city, there are a few nice places to pick up gifts last-minute, so I didn’t turn up empty-handed. So… I thought I’d dedicate today’s inaugural #tuesdaytreats to housewarming gifts. Next time, I’ll be much better prepared! My pick of 5 fabulous housewarming gifts to follow… but which will steal the ‘G Top Spot’ accolade today? I hope these inspire you! Aspinal of London Guest Book in Ivory Calf – Sophisticated at £49. 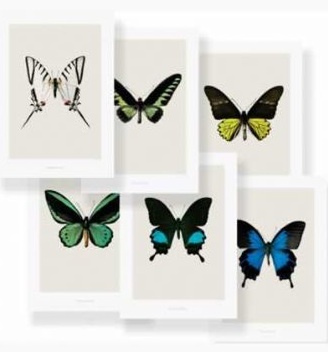 Set of 6 Butterfly Prints from @RockettStGeorge – Beautiful at £29. Books Make A Home: Elegant Ideas for Storing and Displaying Books from @OliverBonas – Bookish charm at £19.99. Stripy Doggy Doorstops from @grahamandgreen – The Dog’s B*llocks at £39. White Mulberry Hand Care Set from @MoltonBrownUK – Classic at £39. Plus spend £40 at the moment and get a free shower gel! According to the PFMA, in 2011 there were 8 million cats & 8 million dogs in the UK. To celebrate our love of pets, today’s feature looks at stylish accessories for cats & dogs. 5 items will receive today’s #mysterymonday gongs. But which camp are you in? Cat or dog? Harry Barker Bon Chien Dog Food Storage from Hair of the Dog London – “Bon Chien, Bon Appetit” – Smart at £44. Alessi Tigrito Cat Bowl by Alessi from @AmaraUK – Sleak at £42. Union Jack Walled Dog Bed by Hugo & Hennie from @notonthehighst – Patriotic at £91. Emma Bridgewater Personalised Red Star Small Pet Bowl – Pretty at £20. Green Kitten Starter Kit from Hair of the Dog London “the purrrfect gift for your kitten or cat” – Cute at £30. So which of these beautiful cat and dog accessories will receive the coveted ‘G Top Spot’ Award? Is the leading role a cat or a dog? Aubergine Snooze Velvet Sofa by Graham and Green and as featured in the March issue of Living etc magazine – Gorgeous at £2,250. Deco sofa by couch design as featured on Notonthehighstreet – Cool at £2,100. Chamonix Velvet Chocolate Sofa by Sweet Pea and Willow “Would not look out of place in a ski chalet” – Luxury at £1,480. Fearn Upholstered Small 2 Seater Sofa in Caitlyn Silver by Laura Ashley – Lush at £600. Flatford Large Sofa from Sofas and Stuff in Moon Earth Charcoal – Stylish at £1,070.